As per the Rules of Home Brew, while we were making a Double IPA today (recipe coming), we were drinking home brew while making home brew. Also, as mentioned in our Wildly Inaccurate Facts About Beer, there can sometimes be a bit of down time during brewing, so we get a bit stupid. 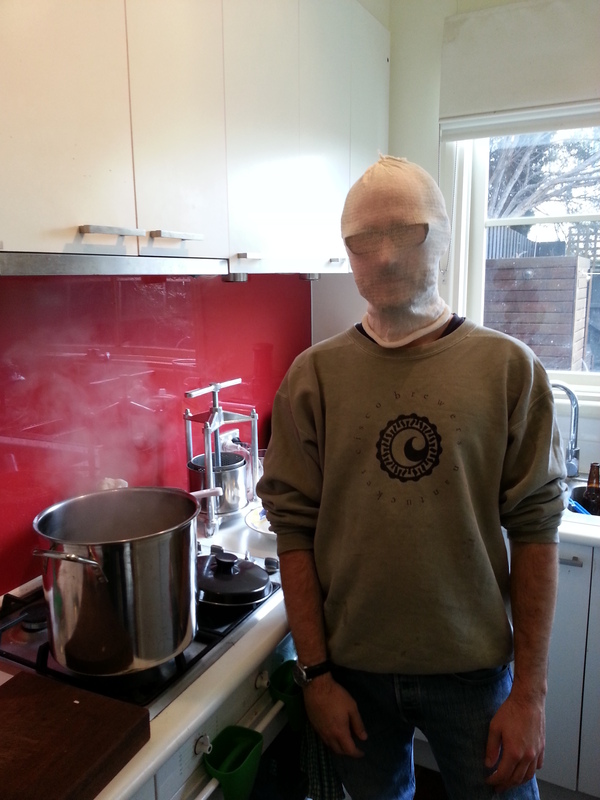 This is what happens when you have a spare grain bag and a few minutes to kill during the boil. I was quite surprised at how hot I got in there. I didn’t expect a grain bag to be so well insulating! Oh, and for those who are a bit more observant, the metal contraption behind me is the brand new fruit press that my mom bought me for my birthday! I haven’t been completely satisfied with how much juice I’m getting out of my juicer, as I mentioned when making some hopped cider, so hopefully this will do the job better. It will surely get some use soon. The press may not be robust enough to press full apples, but since the juicer ends up with so much pulp, it will come in handy for pressing any remaining juice out of the pulp. I have found that the pulp holds a lot of juice, but it’s impossible to squeeze this out. And obviously I can press other things as well! That’s it from me until I finish off the new Double IPA recipe that we made today. PS. Thanks again to my mother for taking me to the home brew store and basically letting me go nuts! PPS. Sorry dad for not thanking you directly, but as awesome as the angle grinder is, this ain’t no power tool blog! PPS. My dad got me an angle grinder by the way… Thanks dad!